(Rehovot, Israel) March 3rd, 2016 –XJet Ltd., an Israeli metal 3D printing company announced the completion of an additional round of funding of $25 million. Companies in the field of 3D printing have received much attention recently, particularly those within the metal additive manufacturing arena, which has shown tremendous growth. The funding round was led by the Catalyst CEL Fund, a private Israeli-Chinese private equity fund and Autodesk, Inc., a leader in 3D design engineering and entertainment software, through its Spark Investment Fund, as well as other existing shareholders. Xjet’s ground-breaking technology called NanoParticle JettingTM uses nanoparticles in liquid suspension to build 3D metal parts. The technology enables a more accurate production of highly complex parts than that of other current technologies. 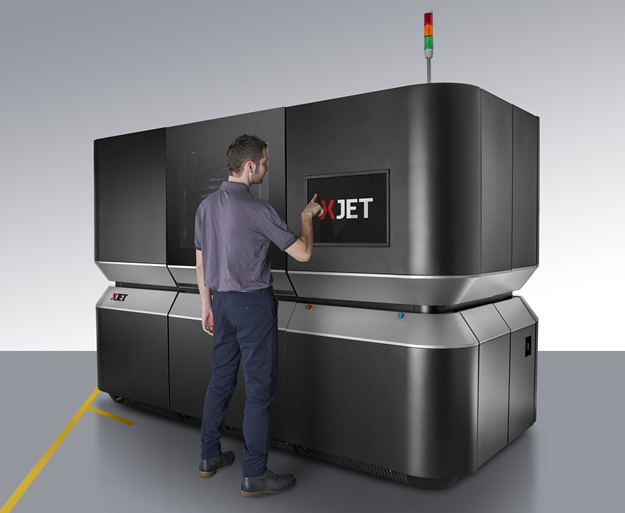 XJet changed its focus from the solar arena to concentrate exclusively on the development of a solution for the metal additive manufacturing industry during the last two years. The current round of funding will be used to complete the development of and to launch Xjet products into main international markets. The investors in previous rounds included Gemini Israel Ventures, Landa Ventures, Applied Materials, Good Energies and Chinese investors. In 2014, the Company raised an additional $22 million from Alumot and from existing shareholders to complete the changes in direction of the technology from solar to 3D metal printing. XJet is located in the Rehovot Science Park, Israel. It was founded by Hanan Gothait, a serial entrepreneur and veteran of the inkjet printing industry. Gothait was a co-founder of Objet Geometries, which later merged with Stratasys. Xjet has more than 60 employees, including a large number of veteran leaders of the 3D printing industry and has filed over fifty patents in various fields. Autodesk is a global leader of 3D design software that develops software for cloud services and applications for a wide range of industries such as architecture, engineering, infrastructure, construction, manufacturing, automotive, entertainment and media, interior design and digital art. The Catalyst CEL Fund is the first dedicated Israel-China private equity fund, which was established in partnership with Catalyst Private Equity, a leading Israeli private equity firm and China Everbright Limited, a leading Hong Kong based asset manager. The Fund is represented by managing partner Yair Shamir who was appointed Chairman of XJet. The Fund supports the growth and market entry of Israeli companies into Greater China and thus acts as an important gateway between Israeli innovation and the Chinese economy. Xjet anticipates exhibiting its technology in the U.S. at RAPID 2016, in Orlando on May 17, 2016, and later in Germany later in the year at a major tradeshow. Visit http://www.xjet3d.com or http://www.autodeskrnd.co.il for further information. XJet Ltd. was founded in 2005 by Hanan Gothait, an innovator and veteran of the inkjet printing industry. XJet brings to market the first ground-breaking inkjet-based 3D printing system for metal parts. Established in Rehovot, the hub of the Israeli “Silicon Valley”, XJet boasts 50 multidisciplinary R&D specialists and has filed more than 50 registered and pending patents. Originally it developed a solution for the solar industry, and expanded into the additive manufacturing world in the end of 2013. With a decade’s-worth of research behind it, XJet pioneers NanoParticle Jetting™ technology to transform the metal additive manufacturing industry. This entry was posted in News and tagged Autodesk, Autodesk Israel, Catalyst CEL Fund, Dror Danai, Eitan Tsarfati, Hanan Gothait, Inc., NanoParticle JettingTM, Spark Investment Fund, XJet Ltd. by david. Bookmark the permalink.